Timeless, personal and high-quality renovations are the tenet of Westmount Craftsmen’s design philosophy. While your home may seem like a work in progress – evolving and changing with the needs of your household – Westmount Craftsmen believes the fundamental elements of home design are timeless. The core design for each of your living spaces should serve as a high-quality canvas from which accessories, furnishings and accents can be changed to accommodate fluctuating design trends. Westmount Craftsmen is a family-owned and fully-insured general contractor company in the Kitchener Waterloo area. Our entire team is dedicated to a finished product that exceeds your expectations. We take a unique design approach, spending a substantial amount of time working with you on the front end of the design phase. This guarantees each aspect of the design addresses your problems, meets your needs and makes your aesthetic dreams a reality. Whether you are embarking on a full home renovation or are ready to update your kitchen or bathroom, Westmount Craftsmen, takes the time to get to know you and your lifestyle. We want each room in your house to be welcoming and attractive while facilitating a stress-free lifestyle. A stress-free renovation from start to finish. That’s right! Stress FREE! A design approach tailored to your tastes and lifestyle, so the finished design is entirely unique. The highest level of customer service available. The best quality products and finishes on the market so you can enjoy a practically maintenance-free living space. As a local general contractor, we understand the value of supporting other local businesses. When you work with Westmount Craftsmen, you’re supporting the community. We work exclusively with our local sub contractors, vendors and suppliers whenever possible. Which area of Your Home are You ready to Renovate next? Ready to rip it all out and start from scratch? Our full house renovations evaluate what works and what doesn’t in your current design and then begins to piece it back together in a way that flows with your tastes and the household’s day-to-day routine. It’s the best way to get a brand new home without actually building one! Tired of bumping into one another in the kitchen? Ready for a layout that flows while enjoying modern building materials that handle the wear-and-tear of daily kitchen life? We’ll design a kitchen that looks and feels more spacious than the one you have now or we’ll add on to provide the extra space you need to enjoy a kitchen that is truly the heart of your home. We take everything into consideration from aesthetics to layout to make sure your bathroom looks fantastic, is easy to maintain and is 100% watertight. From spa-like master baths with steam showers and Jacuzzi tubs to customized small baths for the kids, your bathroom renovation will be built to last. To tell you the truth, basement renovations may be one our favorite renovation projects of all. There is something so satisfying about taking a dark, often damp, and underused space and making it one of the most popular hangouts in the home. We will transform your basement into a bright and spacious showpiece, ideal for the family game room or a legal rental unit. Either way, it will increase your property’s value, not to mention your enjoyment of the basement. We also perform additional renovation services, including hard surface flooring replacement and the installation of windows and doors that will improve curb appeal and enhance your home’s energy efficiency. Like we said before, your home isn’t just another job to get through, it’s our current pride and joy. 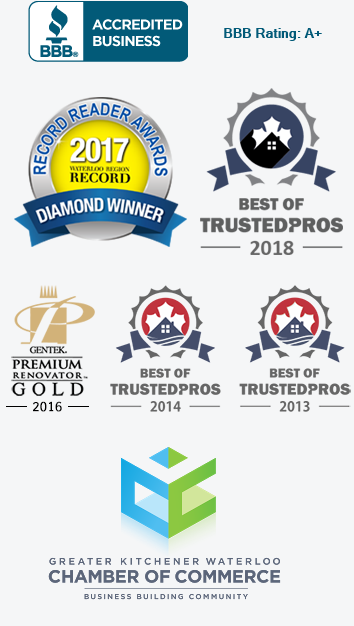 Westmount Craftsmen’s entire team is dedicated to completing home remodels that are so outstanding we would be proud to live in them ourselves. Give us a call at (519) 635-7089 or fill out the form below to schedule your first consultation. We look forward to completing one-of-a-kind home renovations that will last a lifetime.